Sometimes the restaurants just don't cut it. Neither do people. Lazy Sunday, want a brunch, but don't want to step out. All brunches don't have pancakes. Don't want to wake up early and head for breakfast. Feel like cooking, but don't want to cook too much. Want to make pasta, but don't want to make the pasta from scratch! Contradictions, contradictions. Life is so full of them! The want-to vs the to-do list rarely matches. Especially on Sundays. So when that happened and the family wanted a brunch, I decided to cook the brunch. Not the chef type cooking, but the lazy man type cooking. And therefore almost everything that went into making food was food itself! Missing in all brunches, so Pancakes. Since there was mood for Mexican, Tacos. And the mood for dessert, so lazy man ice-cream. What's brunch without some tea, so English Breakfast tea! Easy peasy. 3 large potatoes, grated with a cheese grater or any other instrument that makes it thin and long, pinch of salt, generous amounts of oregano, mix and set aside. The most important thing here is that the potatoes must be as dry as possible! This is the lazy man cooking brunch, I picked a box of Betty Cooper pancake mix! 1/2 a box with one egg and 350 ml milk. Mix and make the batter. Set aside. Two down. I didn't make the pasta from scratch, so I used Barilla spaghetti, so no prep there. Sunday brunch by a lazy man, so no making the sauce too. I used the Barilla Zuchini Pasta sauce, so no prep there. For the chicken, I beat down two breast pieces to even them out and dried them with a kitchen cloth. Marinate with salt, pepper and lime juice for a while. Grate parmesan cheese and mix with equal portions of bread crumbs. Beat an egg and keep in a separate bowl. Prep over. 3 down. This took the longest time to prep, but also ended being great, so it was well worth it. I bought a Salsito taco kit which came with 12 tacos, a taco seasoning mix and a taco sauce. I had soaked a bowl of rajma in water the previous night. You will need to set aside 400g of minced chicken, but do not add any seasoning to it. Slice lettuce into small pieces and keep a can of American sweet corn and Sour Cream ready. 4 down. Slice four bananas into inch thick pieces and freeze overnight. Prep over. Simple. 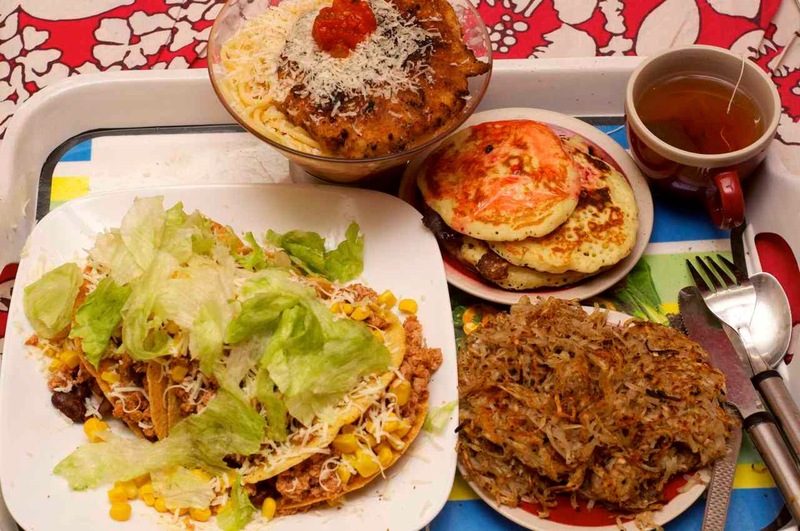 Start with the tacos as they take the longest to cook. Heat a deep cooking vessel with a dash of oil and drop the minced meat inside for a minute to just coat it. Add the Salsito taco mix to the vessel and mix well and soon as it is coated around the chicken, add two glasses of water and cook until the water almost evaporates. Make sure that you don't over cook, as the chicken should be juicy and not dry. For 400g, it took me about 10-12 minutes. Get a pan lightly greased with olive oil and keep it over the stove till it is hot. Take a piece of the marinated chicken breast, dip it in the beaten egg mix, coat it with the parmesan - bread crumb mix and shallow fry it. Typically it should take about 4-5 minutes before one side is golden brown and once it gets that colour, turn it and cook the other side till it gets the colour, about 3-4 minutes. Ensure that you do not over cook the chicken, but equally important is to ensure that it is not undercooked. I cut the edge to make sure that the whole piece is white inside! While the chicken is cooking, its a good time to get the pasta rolling, so bring a rice cooking vessel with water to the boil with a pinch of salt and a teaspoon of olive oil. Once it gets boiling, the pasta should take about 8-10 minutes to become al-dente. By this time time you should have both your tacos and the pasta ready to plate, so its best to keep them warm in the oven or in a hot box. Now the last part of the cooking. In one pan, grease with some butter and oil and fry the pancakes till they are golden on one side before turing them to the other side. In another flat pan greased with olive oil, pour a thin layer of the grated potatoes and fry till golden brown. Turning this around takes some practice, but it has to be done! Its okay if a few pieces don't turn properly! 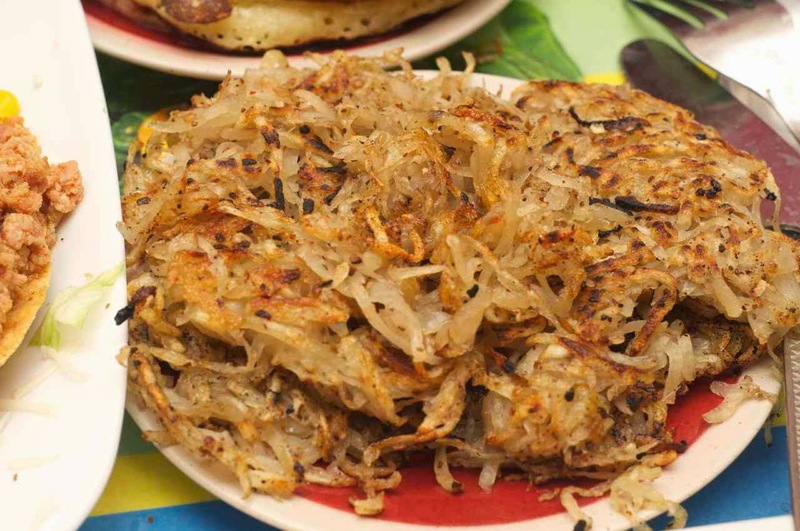 Both the pancakes and the hash browns should take about 10 minutes to get done. While these are getting done, you can heat the taco shells in the oven for about 2-3 minutes. You can start plating the brunch tray now. 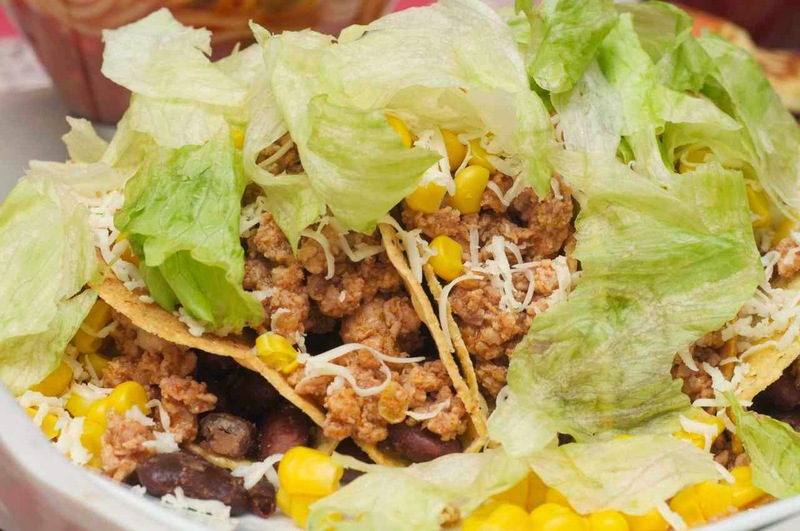 Place four taco shells on the plate and put in a generous amount of rajma and minced chicken and top it off with american corn, grated cheese, lettuce leaves and top it off with the Salsito Taco salsa and some sour cream. 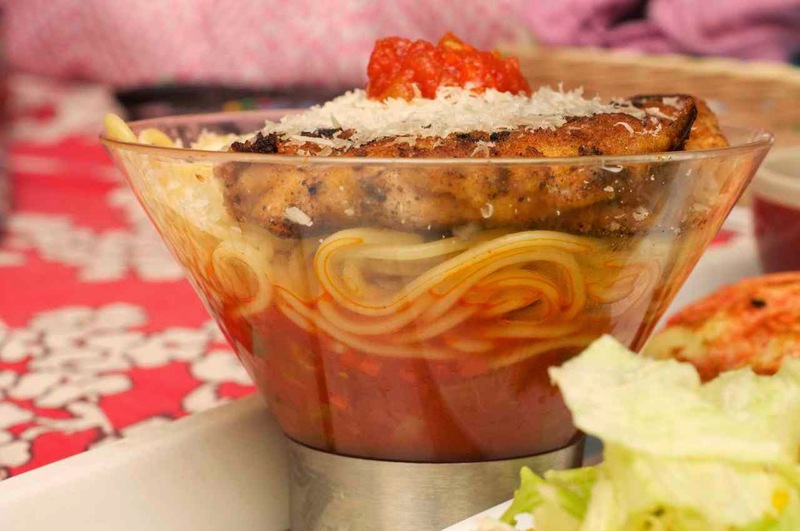 I plated the pasta in a deep bowl which I filled with the pasta sauce, placed the pasta on the sauce and the breast piece on top and finished off with a little grated parmesan cheese. 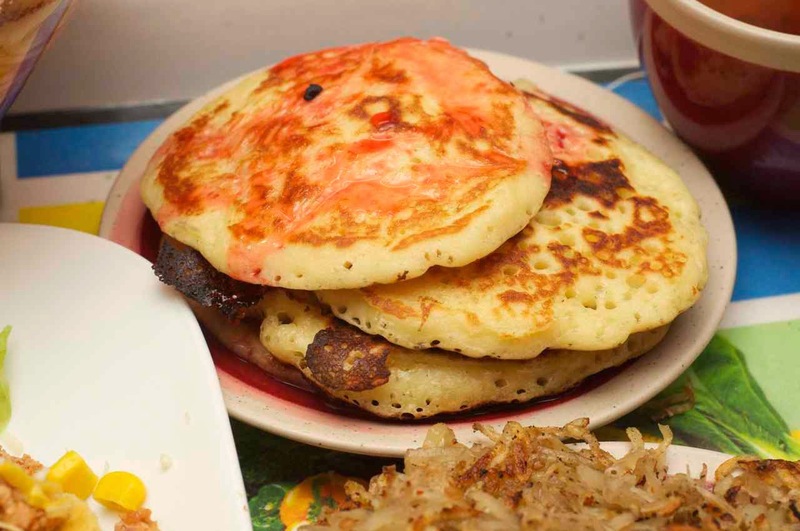 The pancakes can go on one side topped with your favourite topping, for me, this time it was Hershey's Strawberry syrup, but of course maple syrup would be great too and place the hash brown potatoes on another side for a fabulous brunch tray! Dessert? Put the frozen banana slices in food processor and run it and in a few minutes you will have the lazy man's banana ice cream. Tea or coffee and you're done! Now. Start eating or sharing!